Synoviocyte Growth Medium is a sterile medium designed to optimize the growth and promotion of in vitro synoviocyte or fibroblast-like synoviocyte (FLS) cultures. The basal medium is a complex formulation that contains essential and non-essential amino acids, vitamins, organic and inorganic compounds, hormones, growth factors and trace minerals. A supplement containing additional factors and bovine calf serum needs to be combined with the basal medium before use. All bovine serum lots have been tested for the ability to promote growth, adherence rate and the promotion of cell morphology. 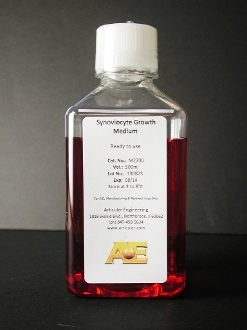 Medium can be purchased with normal bovine serum levels (10% total volume) or low serum (2%) and with or without phenol red. Product can be stored for up to 6 months with basal medium at 4oC and supplement frozen at -20oC. Once supplement is added to medium product is stable for 1 month at 4oC in the dark.